or: Can you hit two webs in a turn? Tim's movement algorithms contain a number of artifacts which make mine hits a little more complicated than rolling a dice. This analysis has been published first in May 2003, in news:alt.games.vga-planets, articles <1053339626.irz765%sr21@inf.tu-dresden.de> and <1053427025.irz750%sr21@inf.tu-dresden.de>. It has been merged and reformatted for this web page in October 2009. 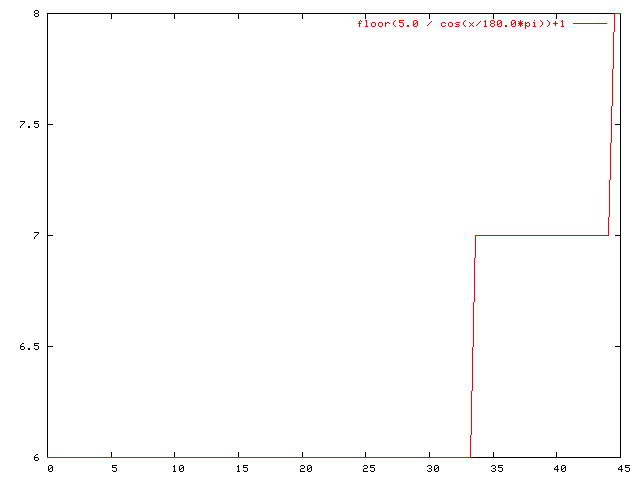 The analysis started when people noticed that web mine hit odds aren't exactly 5% as configured. Andreas Huck from Tholian Strategic Headquarters (now defunct?) finally backed those observations by running thousands of sims and doing a little statistics. So I sat down with a decompiler, to find out what really happens. The code fragments on this page are pseudo-code produced by that decompiler. Warning: hefty technical details follow. Scale: an obscure parameter with interesting effects, we'll see more on that later. Num_mines: Before moving each ship, HOST prepares an array "Minefield_array" with all minefields which can possibly affect the ship. Num_mines is the number of mines in that array. As you see I have omitted quite a lot red tape. Nothing spectacular here, just some pythagoras tests, allies etc. The web hit odds are scaled by an obscure factor. We'll remember that for later. Assuming that the factor is 1, web hit odds still are too high. If you configure 5%, the ">=" test will still yield true in 6 out of 100 cases. The relation sign should be ">", or the Trunc should be dropped. Crystals never hit web mines. A well-known misfeature. To summarize, the web hit rate is Trunc(scale * config) + 1. Drain fuel. You know it. No surprise here. Tell movement that this ship should stop. Note that this does not stop the "for-all-minefields" loop, so you can hit another web this turn. Even another normal mine. That's what Andreas observed. 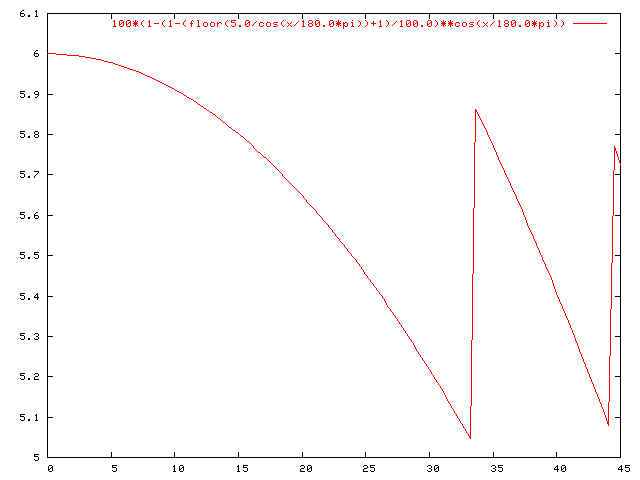 Movement uses the Bresenham algorithm. When moving 1 ly along the major axis, it uses a smaller step along the minor axis. For example, when you're going 10 ly right and 2 ly up, the ship will make 10 steps, each one 1 ly to the right and 0.2 ly up. The length of each of these steps, slightly more than 1 ly, is computed above as Scale. See Movement on Donovan's VGAP Help Pages for details on movement. We have seen that movement happens in steps of different size, and that those use different mine hit odds. To be able to compare them, we'll now compute an effective hit rate. Now let's compute Scale. For simplicity, we assume to move somehow between 0 and 45 degrees. All other angles are symmetric to that. These are the rates you would use to compute your mine hit odds. For example, to compute the chance to successfully pass through 17 ly of webs at a particular angle, you would compute (1 - Eff_Rate)^17. Note the two minima at about 33° and 44°. This means you minimize your risk of hitting a mine by moving along one of these angles. Summarized, from 0 to approximate 32 degrees, the chance to hit two minefields is 6%. From 32° to 43°, it's 7%, above that, it's 8%. The average is 6.28%. That is, over all you web mine hits in all your games, 6.28% of all times you'll hit two fields with one ship. Why is this so complicated? Where is the problem? Why can't the web hit rate not just be 5%, as documented? The used formula, Rate_Step% = Config_web_hit_rate*Scale, is a valid approximation for small values of Scale, but not for larger ones. In addition, the actual comparison for mine hits, as noted above, contains a minor mistake, which amplifies the formula problem. Andreas Huck gave the motivation to this analysis by publishing his experimental results. Those results agree with my mathematical derivations. Unfortunately, they are no longer online. If you wish to redistribute stuff from these pages, please play by the rules: Copyright information.